Love Theme from "One Eyed Jacks"
Compilation released in 1995 as part of Time Life's Instrumental Favorites series. Art Studio: KINETIK Communication Graphics, Inc. The author: Joseph Lanza, author of Elevator Music: A Surreal History of Muzak, Easy-Listening, and Other Moodsong (from St. Martin’s Press), is a journalist whose interests include popular music, film history and theme park culture. Time-Life music wishes to thank William K. Schurk of the Music Library and Sound Recordings Archives, Bowling Green State University, Bowling Green, Ohio for providing valuable reference material. Cover photo manipulation by KINETIK. Coer photo courtesy of Ewing Galloway. Ferrante & Teicher photos courtesy of Globe Photos/BGSU. Apart from both being child prodigies, pianists Ferrante and Teicher were swept by circumstances and coincidences that forged a supernatural bond. Once they graduated, Ferrante and Teicher became Juilliard’s youngest theory and composition teachers. They also burned the midnight oil conjuring a repertoire for a performing career that began with the Toledo Symphony. BY 1947, their concert work was a full-time occupation, but their means were still modest. These early engagements had them setting up their own stage and driving a delivery truck to shuttle their instruments form town to town. In between the more lofty appearances with symphony orchestras, their variations on the classics also graced churches and cafeterias. However, a regimen of classics alone soon proved tiresome. For diversion Ferrante and Teicher tinkered with show and movie tunes, often ending their acts with raucous takes on popular standards and letting a more eccentric side eclipse their otherwise decorous image. This wayward flirtation paid off in the short-run. By the late ‘50s, they became pop music’s answer to John Cage, hitching onto various record labels to make avant-garde albums on which they experimented with songs such as Tea for Two by wedging cardboard, rubber stops and sandpaper in between the piano strings. Though comedic auteurs such as Ernie Kovacs invited them to perform on television, the albums did not make much money. The magic year was 1960, in which Ferrante and Teicher evolved from “duo-pianists” into a two-man show with true commercial promise. Composer and arranger Don Costa (who had sold 10 million copies of his hit version of the title song Never on Sunday from the United Artists movie) inspired them to bring United Artists film music into the top 40. Accomplished conductor Nick Perito supplied nearly all of the duo’s arrangements; they enraptured listeners with lush interpretations of stage tunes, pop favorites and a bevy of movie themes. Their first hit, Theme from “The Apartment,” sold 750,000 records during the first three weeks of its release. It also it No. 10 on the Billboard chart in 1960, only to be surpassed that same year by their theme from Exodus, which climbed to the No. 2 spot. From there, they would have five Billboard top-40 hits, 11 on the “Hot 100” between 1960 and 1970 and more than 20 million record sales. 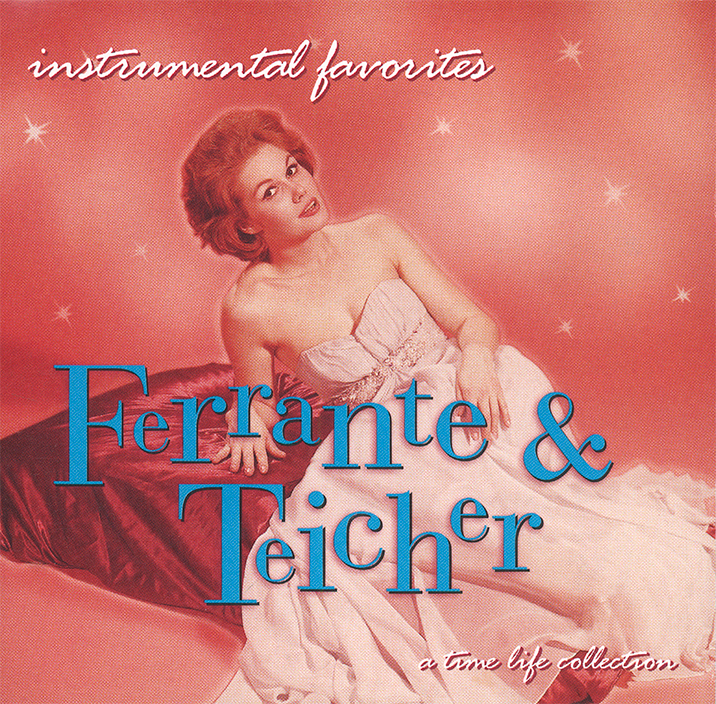 Through the years, Ferrante and Teicher’s twin pianos took full advantage of stereophonic sound innovations with lavish orchestral backings and otherworldly choruses. Their range of styles encompassed the sweeping spectacle of Love Theme from “One Eyed Jacks,” the exotic Moon of Manakoora and the haunting candlelight panache of Alone Together. The duo also retained subtle traces of their experimental edge with such pieces as their masterful 1969 interpretation of John Barry’s theme from Midnight Cowboy. Besides the pairing of harpsichord and piano and the chorus rising and falling at strategic moments, much of the credit for the mystifying style of Midnight Cowboy goes to session guitarist Vincent Bell and his memorable “water sound.” The song climbed to No. 10 on the charts, and proved a cross-generational hit in an era when the much touted “generation gap” resembled a ravine. As this collection demonstrates, Ferrante and Teicher offer a mix of musical trends that emerged during one of America’s most turbulent decades. Classical, romantic ballad, Latin, exotica and a smattering of rock become, in their four hands, a colorful mood music blend that combines the best of both concert hall grandeur and living room intimacy.